We are always looking at ways to improve our homes and add a touch of the personal to really make it our own. Why not try something a little out of the ordinary and use glass to create a feature and not the sort you drink from? This article gives some suggestions. Glass has long been used for windows, to let natural light into a room. Having glass further inside the room, as a room divider, for example, allows light to travel a greater distance. Using coloured or textured glass will create added interest by creating interesting effects as the light hits it and might even be different at different times of the day or year, depending on the sun's position. In the same way as one might hang a painting as a focal point in a room, hanging decorative glass panels can make a statement. There are 'off the shelf' options available, with pictures or graphic designs to suit most tastes. Alternatively, have a piece custom made to suit your personality and you will create a truly unique style statement for your home. Have a traditional framed picture size, or push the boat out and cover a whole wall! The limit is only as far as your imagination will go. Using glass in interior doors is a functional, practical way of allowing light in creating an illusion of more space, without being as adventurous as a wall-sized panel. An en-suite bathroom is a good example of how one might be used and clever technology can even give you privacy glass for those times when you just want to be alone! Frosted glass is another option. For a less permanent option using glass, try incorporating it into some furniture; a desk or coffee table, perhaps, even a bookcase. The effect is very modern, especially if teamed with chrome or leather, but by adding decorative glass panels to your piece, you can create furniture as unique as you are. It is costly, however, compared to other materials. If you are looking at using a lot in your home, particularly in a single project, try to see the bigger picture: consider it as an investment. If you do not intend to decorate again for five years, ten years, even fifteen or more, the cost per year will decrease considerably and does not look like such a scary number! Alternatively, start small. 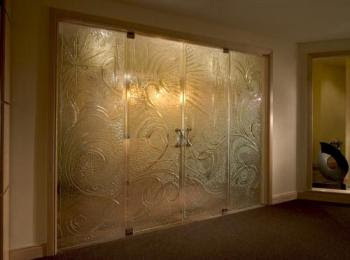 Check Dream Glass Group for decorative glass panels and go from there. A smaller panel could become a family heirloom. Whatever you decide, enjoy your glass. Tom Campbell writes regularly on style-related topics for various websites and blogs. He specialises in interior design and loves experimenting with ways of getting light into a room. He has recently redesigned the family bathroom in his home using decorative glass panels for privacy. Check Dream Glass Group for decorative glass panels and ideas on where to use them.